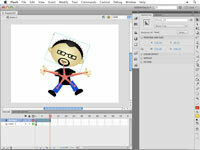 After you create a series of connected IK objects in Adobe Flash Creative Suite 5, you can put them into motion with poses. 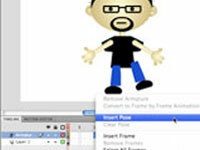 Poses capture different positions of your IK objects, and Flash CS5 can animate from pose to pose to create sophisticated animation sequences. After an Armature layer is created, poses can be inserted (much like keyframes) to note different points along the Timeline where a new pose will be created. 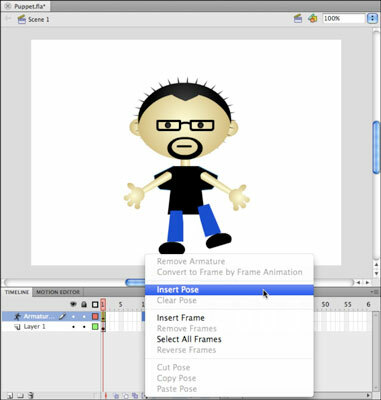 1Click and select an empty frame on an existing Armature layer (for example, Frame 15). Handles will appear on the frame to show it is selected. 2Right-click (Windows) or Control-click (Mac) the selected frame and choose Insert Pose from the contextual menu that appears. A new keyframe is created, where you can pose the IK objects again. Much like a keyframe, a pose lets you change the position of IK objects at a specific point on the Timeline. 3Choose the Selection tool and reposition the connected objects on the Armature layer to create a unique pose. The new pose you create can be a subtle move or a big change from the previous one. 4Press Enter or Return to play back the Timeline. 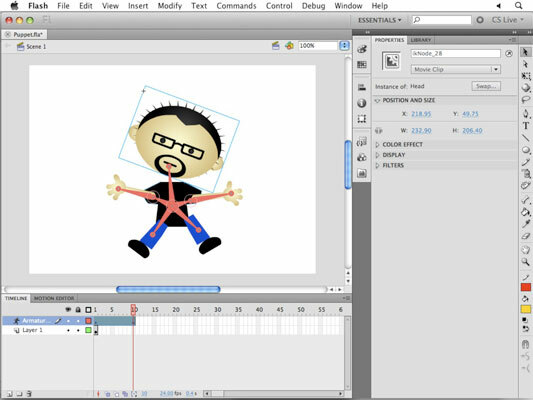 Flash creates an animation to transition from one pose to the next.